Im back with a giveaway! & this time its big!!! Here you have a chance to win 3 beautiful pieces of jewellery! favordeal.com is offering 1 winner with 3 pieces of jewellery. Favordeal has amazing collection of jewellery. They are very inexpensive & very fashionable. They have discount even more than 50% OFF in their website,which mainly under our clearance page. they also have the daily/weekly special under which give 10-30% discount . The home page will often show three products which will give more than 70% discount daily specials. Just fill in the rafflecopter from below! This is an International Giveaway which means anyone can enter! 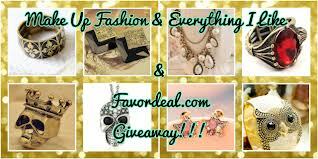 1 lucky winner will win 3 jewellery pieces from favordeal.com. They have to choose from the styles given above. The Giveaway runs from 15th August to 17th September 2012. You must be 18+ of age to enter this giveaway. Please make sure all the entries are valid and justifiable. I will check each & every entry. This is a sponsored giveaway. The blog or the blog owner will not be responsible for jewellery. Winner will be contacted by email within 24 hours after the giveaway ends. If the first winner fails to respond within 24 hours, second winner shall be chosen. If a winner fails to meet the giveaway rules, I will choose a second person randomly. 1.) Antique drop pearl pendant bib necklace. 2.) Large rhinestone mysterious design ring. 3.) Vintage costume jewelry multicolor star ladies chic stud earrings. i would like to win the 1st, 4th and the last one. large rhinestone mysterious design ring, antique drop pearl pendant bib necklace and old fashioned black flower bangle bracelet are my fav! hi, thanks for the giveaway dear!! Sorry didnt know had to choose among theses..my new favs are Antique drop pearl pendant bib necklace, vintage personalized owl bracelet, old fashioned black flower bangle bracelet. thanks for the giveaway shourima!! 1. Antique drop pearl pendant bib necklace. 1)antique drop pearl pendant bib necklace. 2)vintage fashion personlized owl bangle bracelet. 3)old fashioned black flower bangle bracelet. I'd like to win the vintage solid flower cool stud earrings, the large rhinestone mysterious design ring and the old fashioned black flower bangle bracelet. ALthough they are all lovely, these three are the best. vintage fashion personlized owl bangle bracelet. large rhinestone mysterious design ring sorry for repeat.. Awesome giveaway.. Thanks, Nice collection. I like all products, especially long necklaces. Thanks for the giveaway and I'll be looking forward to your posts!!! -The old fashioned black flower bangle bracelet. -The vintage costume jewelry multicolor star ladies chic stud earrings. hey thanks alot! glad u like my blog! all the best! hey alba! im happy that i cud be of so much help to you! thanks alot!!! I like the pearl bib necklace, the flower stud earrings and the black bracelet! I would love to have the skull ring, old flower bracelet and Red rhinestone mysterious design ring. I would love to win this: antique drop pearl pendant bib necklace, old fashioned black flower bangle bracelet, and vintage solid flower cool stud earrings. i would love to have antique drop pearl pendant bib necklace ,vintage solid flower cool stud earrings and vintage fashion personlized owl bangle bracelet.